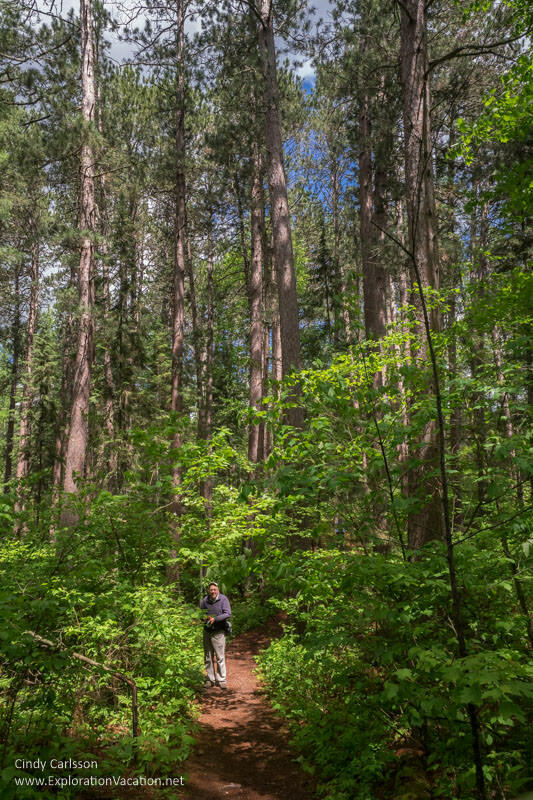 Visitors to Minnesota’s Lost Forty have the rare opportunity to explore the northern pine forest as it existed before 98% of it was sent off to sawmills. Minnesota’s northern lake country is known for the forests that blanket the lake-studded landscape. But few realize that the mix of pine, aspen, birch, and maple common in the northern woods today is a recent phenomenon. Just 150 years ago northern Minnesota was a vast forest of towering pines. Beginning in the 1830s, Minnesota’s native pines –particularly white pines – were mowed down by saw-wielding lumberjacks and send off to sawmills. Starting along the Saint Croix River, the timber men made their way across the state, towering pines falling in their wake. It didn’t come to an end in 1929 when the last sawmill closed. But by then, virtually every white pine in the state had been turned into lumber. Fortunately, the massacre that eliminated Minnesota’s vast pine forests missed a few small stands of trees. The most impressive of those is known today as the Lost Forty. A 19th century surveying error spared this tract of forest, leaving 144 acres of old-growth red and white pine standing after the sawmills closed and the lumberjacks moved on. Today this bit of Minnesota’s lost forest is protected as the Lost Forty Scientific and Natural Area. It’s one of the few places in the state where visitors can see what northern Minnesota looked like before its majestic pines were cut. The Lost Forty exists because a surveying error identified it as a lake. Being a lake, the property couldn’t be sold. And, since the property couldn’t be sold, it couldn’t be logged. The error wasn’t discovered until 1960. By then people understood what they had lost to the loggers. An early summer storm was rapidly approaching when I finally got to the Lost Forty. But it wasn’t raining yet and the trail through this part of the forest isn’t very long, so we headed out into the trees for a quick look before the rain came. Along the way we learn how to tell a white pine from a red pine. Lumberjacks preferred the white pine because the wood was lighter and floated well – making it easier to cut, haul, and float them down the river to the sawmill. Both are magnificent trees and it is fun to wander below them as the wind sighs in the branches high above. I’m not sure how old these trees are. Some sources say the oldest are over 300 years old. Other say they are “only” a couple hundred years old. Either way, they are big and old for Minnesota trees! Even with the towering trees swaying above us in the wind, it’s impossible not to stop and look down at life closer to the forest floor. Besides the trees, the Lost Forty preserves an under-story filled with native plants both common and rare. The sky turns black and the rain begins just as we come to the end of the loop trail. It was a perfect day to explore a bit of Minnesota’s lost forest. The Lost Forty is in northern Minnesota’s beautiful lake country. The Lost Forty Scientific and Natural Area is located in the Chippewa National Forest near Blackduck, Minnesota. That requires a drive of more than four hours from Minneapolis/ Saint Paul. Fortunately, northern Minnesota is beautiful, so it’s a great place for a vacation! And the Lost Forty is just over an hour from vacation hubs like Grand Rapids, Bemidji, and International Falls. Unlike most of Minnesota’s Scientific and Natural Areas, which lack trails or other visitor facilities, the Lost Forty SNA is set up for casual visitors. There is a good-sized parking area, an interpretive trail with informational placards, picnic tables, and a restroom. There is a very short, totally flat trail and a “longer” loop (less than a mile) over mostly flat ground with a few steeper hills. It’s very easy trail. A spur trail provides carry-in boat access to Coddington Lake. The Lost Forty SNA is open year-round, with options for cross-country skiing in the winter. There is no fee to enter the Lost Forty and a Minnesota parks permit is not required. There are no campgrounds or other lodging within the Lost Forty Scientific and Natural Area. Good story! We have a few white pines in our yard. Thanks, Carolyn. I need to get up to see your white pines – we are way over-do for a get together! 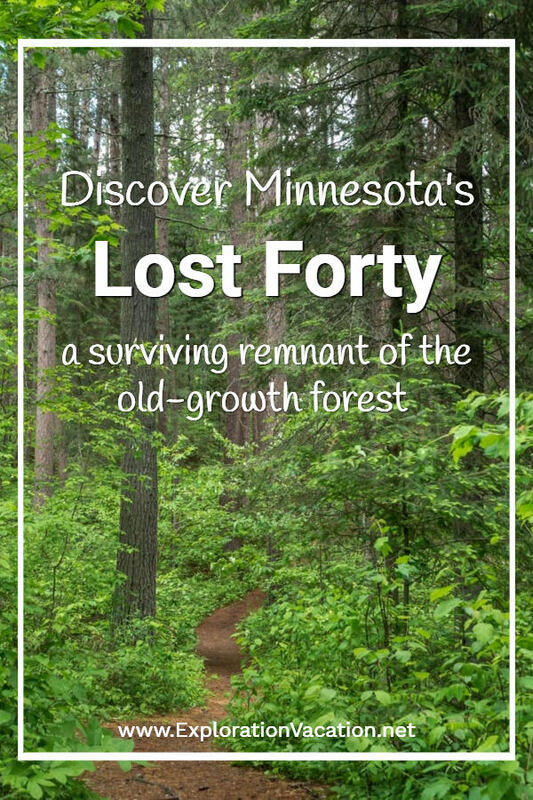 Minnesota’s Lost Forty seems like a great place for hiking, is that a good idea? The scenery seems spectacular, Cindy. 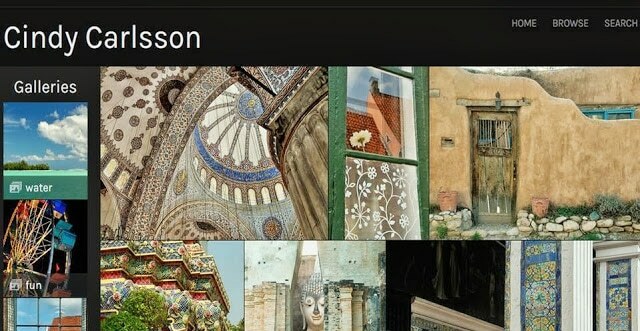 Your post and pictures caused the travel bug to itch me! Lydia – There are nice trails in the park, but they aren’t very long. If you are looking for a longer, more challenging hike, there are several nice trails in almost any direction from the the Lost Forty, including the Bemidji, Grand Rapids, and International Falls areas.